Voting is closed. 8583 users have voted. In the next 20 years, drones are expected to have an increasing impact on people's lives. However, current drone technology only allows its application to tasks that require it to "see” from air, while there are major opportunities for drones if they could also “touch and feel”. Aerial contact CATEC technology is a major step towards this vision and already being uses to perform industrial contact inspections with a drone. This helps many special tasks to get done faster. Furthermore, as the users don't have to work at great height anymore it creates a safer work environment. These advances were possible due to work in the EU-funded AEROARMS project. CATEC is one of the major European research centres developing drone technologies. 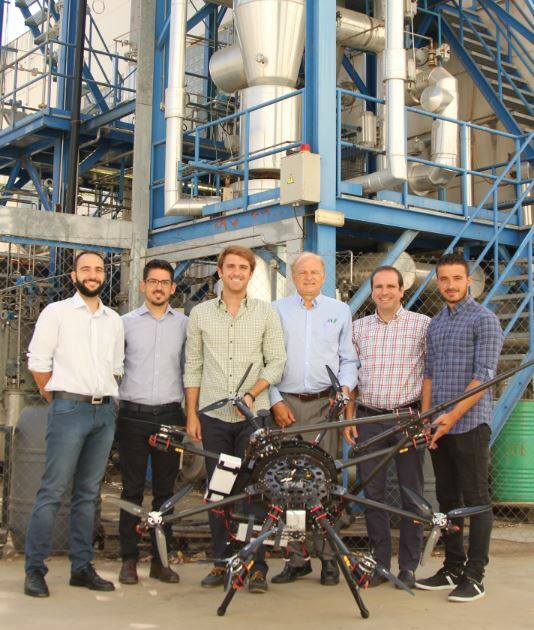 Since 2011 CATEC has been a world leader in aerial robotics manipulation having developed, with the University of Seville, the first drone in the world with advanced aerial manipulation capabilities (https://youtu.be/DsUiAGelj7Q). Recently, we have designed a novel drone that is able to perform inspections (such as ultrasonic) that require contact. This is a major step for drones to not only “see” from air but also “touch and feel”. From the experience acquired since 2011 in aerial manipulation, we have developed a novel technology that is able to maintain contact and exert significant forces in a safe and reliable way. The drone presents a tilted-rotor configuration that allows very precise movements in any direction, and also, a completely novel contact device that permits to decouple and dampen external perturbations from the aerial platform. This is critical to maintain stability of the flight while the drone is maintaining contact. In the last two years we have focused in solving real industrial problems advised by leading end-user companies, in further developing this technology to reach a higher maturity level, and in attracting industry interest. The high expectations, with a potential market of 300M€/year just in Europe, and willingness to transfer the technology to industry motivated us to recently patent this technology. Being nominataed for the Innovation Radar Prize is a major opportunity for us to increase awareness and raise interest in this technology and its potential. Our participation in EC-funded projects has been crucial for our development of advanced aerial manipulation technologies and contributes to the positioning of European institutions as world leaders in aerial robotics. The ARCAS FP7 project allowed the development of the basic aerial manipulation technology which was then validated in a laboratory environment. While the H2020 AEROARMS project has been essential to increase the TRL and come closer to a system that can be used in real industrial applications.